Justin DeVillier, John Folse, Alon Shaya, and Isaac Toups will be amid a group of 62 chefs who have all stuffed offal and rice into hog guts casings for the big 2013 Boudin And Beer party Friday November 7th 2013 at The Foundry in New Orleans. The Foundry’s rich history dates all the way back to 1719 when it was owned by Louisiana governor Jean-Baptiste Le Moyne de Bienville. Over the years the property was used as a cotton mill, plantation, brewery and commercial bank before settling into its current life as a venue for weddings, parties and what have you. Boudin and Beer is a fund raiser for the Emeril Lagasse Foundation, a group that concerns itself with helping disadvantaged children get a leg up in this hard world we’re all living in 2013. Emeril does more good before breakfast than many of us do in our entire lives. In the ten plus years of the existence of his foundation, he’s handed out almost six million dollars to children’s charities. The crown jewel of his fundraising is the annual Boudin Bourbon and Beer party. 7 p.m. – 10 p.m. 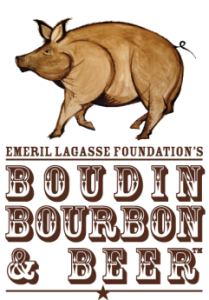 This entry was posted in New Orleans and tagged 2013 boudin bourbon and beer, Alon Shaya, John Folse, Justin DeVillier. Bookmark the permalink.